The Ballard Borehole Seismic Source is a tool designed to enable engineering geophysicists and geotechnical engineers to conduct high quality P- and S-wave crosshole tests in accordance with ASTM standards. Unlike P-wave energy which appears first on a seismic record, S-wave energy must be enhanced to be positively recognized within existing wave trains. This can be best accomplished by a reverse polarity seismic source rich in S-wave energy. Since the polarity of an S-wave can be controlled (unlike the P-wave) the seismic source can provide a positive identification if it is capable of S-wave phase reversal. The Ballard Borehole Seismic Source is designed to offer S-wave enhancement, S-wave phase reversal, suppressed (but adequate) P-wave energy, light weight, signal repeatability, high frequency (fast rise time), maximum reliability, and low cost. 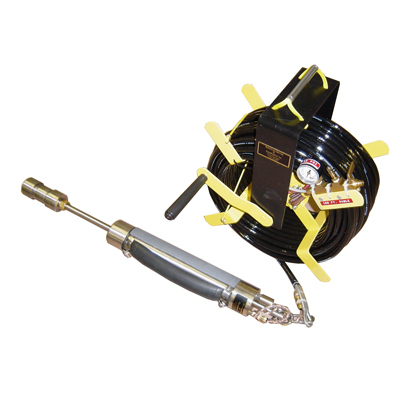 An inflatable sidewall anchor system provides positive borehole clamping. 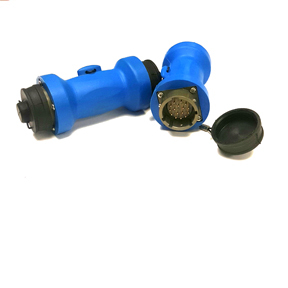 A single three-in-one, 0.5 inch diameter cable houses the controls for reversible spring loaded hammer activation, zero-time geophone and air for the clamping mechanism. In the early days of Crosshole testing, lack of uniform test practices in the engineering arena led to inconsistent and erroneous data. Recognizing that such practices could yield dangerous or undesirable results, the American Society for Testing and Materials (ASTM) formed a task group to study the problem. After nearly five years, “Standard Test Methods for Crosshole Seismic Testing” designation: D 4428/D4428 m-84 was published in the 1985 annual book of ASTM Standards, Volume 04.08, pp. 885-898. The standard was renewed and published with only minor changes in the 1991 annual book of ASTM Standards, Volume 04.08, pp. 691-700. Categories: FEATURED, Downhole / Borehole, Energy Sources. Tag: New.